After enjoying the chestnut ice cream, I wanted to get working on a chocolate-hazelnut version. Because that, together with a scoop of chestnut and a scoop of chocolate gelato, is just about my perfect trifecta in a bowl, and it'd be neat to have those elements in my repertoire. It wouldn't be summer if we weren't daydreaming about ice cream, right? Well, I've been doing plenty of that and to get some of those ice cream daydreams out of system, I made this chocolate hazelnut-praline gelato. I tagged this recipe a while ago (okay, two years ago); the author of this recipe also created the one for chocolate-hazelnut crunch bars, which I love, so I knew I'd be in good hands. So while I vaguely envisioned making chocolate-hazelnut ice cream using an ice cream or gelato base and adding melted gianduja (that wonderful combination of chocolate and hazelnuts, much like Nutella, and the block form of which you can actually buy), I went with this recipe using hazelnut praline paste. It's essentially hazelnut praline, hazelnuts coated with caramelized sugar, ground up into a smooth paste. Buying the paste - instead of attempting to make your own - is a great shortcut. I buy the Love 'n Bake brand and it's pretty readily available in supermarkets alongside the almond paste. I've used it before for hazelnut cake with praline buttercream and chocolate-hazelnut macarons. It is delicious stuff! 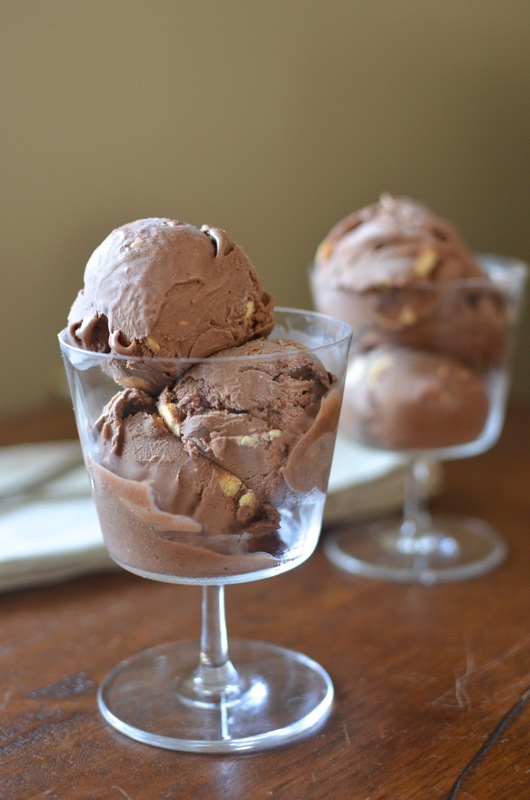 That, along with some melted chocolate, make up the flavor for this delicious chocolate-hazelnut gelato. So what makes this "gelato" instead of ice cream? The distinction is blurred at home since we churn all our homemade frozen treats using the same ice cream machine (in my case, a basic Cuisinart). I simply think of gelato recipes as being somewhat lower in fat (you'll see a more balanced or lower ratio of cream to milk), with the result being a greater intensity of flavor. I am a big fan of gelato. And in this case, this particular gelato turned out with a thick, almost marshmallow-like mouthfeel! It's chocolaty, it's hazelnut-y, and it's got some chopped hazelnuts in every bite to accentuate the flavor and give you a little texture. Unlike classic gelato, which come plain and smooth, I love mix-in's and extra texture. Along with the chopped hazelnuts, I wouldn't have minded a few specks of chocolate running through this gelato either. That said, if you're more of a purist, you can omit the chopped hazelnuts and have a smooth gelato that still has plenty of chocolate and hazelnut flavor. It's all about the flavor. This gelato is based on the familiar custard-base ice cream formula. I used whole milk (2% is also an option) - two cups of it to 1 cup of heavy cream. I love that gelato recipes are lighter on the cream for the obvious reason and for the fact that it really lets the underlying flavor shine through. I used 4 egg yolks instead of 5. It's the number of yolks I generally use for other gelato recipes and I think it's enough. A note on the hazelnut praline paste. When you open up the can, you'll likely see a layer of oil on top and the solid on the bottom. Transfer the mixture to a mixing bowl and stir it all together with a sturdy rubber spatula to combine until as smooth as you can get it. This recipe takes a little more than 1/2 cup of the hazelnut praline. I like to strain my gelato/ice cream base to ensure I have as smooth a mixture as possible and to eliminate any bits of cooked eggs. Chill the mixture thoroughly before churning. Add 1/2 cup of chopped toasted hazelnuts at the last 5 minutes of churning. Then, when the time is right (which is pretty much any time), serve up some homemade chocolate hazelnut-praline gelato to your friends and family. I love the bits of hazelnuts in this gelato and for some reason, I was craving a sugar or waffle cone to go with this. I'll have to save that for next time because this batch of gelato disappeared all too quickly! 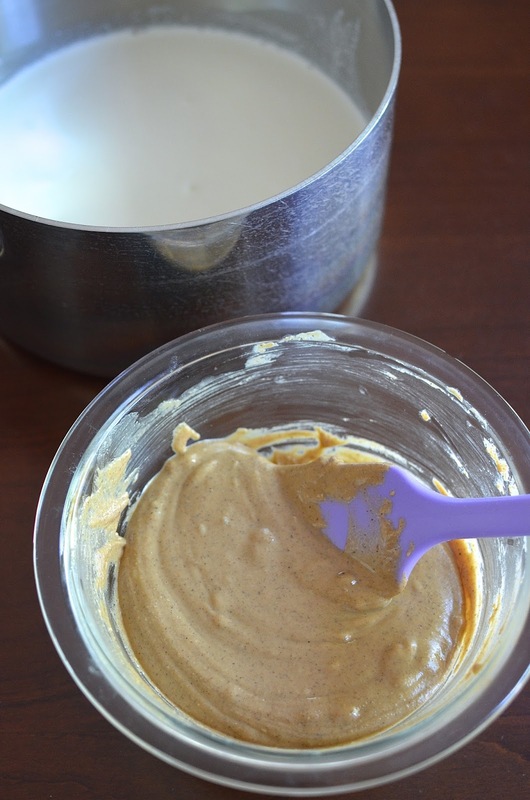 Combine milk, heavy cream, and hazelnut praline paste in a heavy saucepan and cook over medium heat until it comes to a gentle bubble. Whisk in cocoa powder and chocolate until chocolate is melted and mixture is smooth. In a medium mixing bowl, whisk the egg yolks, sugar, and salt until pale yellow and thickened. Temper the egg mixture by slowly adding about a cup of the hot chocolate mixture while whisking constantly. Scrape the mixture back into the saucepan with the rest of the chocolate mixture. Cook mixture over low heat, whisking constantly, until it thickens enough to coat the back of a spoon (180-185 degrees on an instant read thermometer). Remove custard from the heat and strain through a fine mesh strainer into a large bowl. Stir in vanilla extract. Chill mixture completely, preferably overnight. Churn custard using your ice cream maker, according to manufacturer's instructions. About 5 minutes before ice cream is done, when it reaches a custard-like consistency, add the chopped hazelnuts to incorporate. Transfer gelato to a freezer-safe container and freeze until firm. Yes, check it out by the almond paste...the stores that carry the Love 'n Bake brand usually have hazelnut praline and pistachio paste (yes! I've yet to try that) together. You knocked this out of the park Monica! What a gorgeous gelato. It looks so smooth and rich. Love the idea of the hazelnut praline paste - brilliant! Chocolate Hazelnut Praline? Oh my goodness, I love the sound of this flavor combination! It looks so rich and delicious! I have to check out the hazelnut praline paste too! Nothing beats a nice frozen treat during the summer! It's the perfect way to cool down and enjoy a sweet treat! So yummy! I've never ever heard of hazelnut praline paste, but now I must find it! This is SO gorgeous. I've had gelato on my list for a while now and might need to try this one!! It is definitely a great shortcut here. I love how this gelato is so full of rich flavors and contrasting textures, Monica. Though I live with a few year-round ice cream fans, I personally think of ice cream/gelato/ sorbet as summer treat. A bowl of your gelato would definitely be a welcome treat! I could eat ice cream everyday if not for the consequences, Wendy. I have to be very selective now...haha. This makes the cut. A little goes a long way when you have rich flavors. This looks incredibly creamy and rich! It's got great flavor, yes. Thanks, Angie. This cream looks so creamy and the flavors are the bomb here!! Wish I could eat a giant bowl right now!! Pinning! Those of us who love chocolate and hazelnut seem pretty passionate about it, right? ; ) Thanks! The next time I make ice cream (or gelato) I know where I'm coming for a recipe! This looks so delicious. Simply damn delicious fancy gelato!!! OMG! I crave it so much! Chocolate hazelnut is my favorite flavor! You just made my day! That might be my most favorite ice cream/gelato ever. I've got to first get my hands on a ice cream maker and then that awesome hazelnut praline paste. You have absolutely created a rich, smooth and yummy combo there. I really can't stop looking at the pictures and dreaming of having a bowl right about now. Ice cream/gelato is just too good! Once in a while, we've just got to indulge and enjoy it to the max! Oh my that would not last long at our house. I love gelato too and the flavour combo is so delicious. You are seriously making me think about getting an ice-cream churner. Beautiful photos, I admire your gorgeous shots you could get before it all melted. Definitely a 'grown ups' gelato this one Monica! Such a great flavour combination. Roll on the holidays so I can busy making frozen desserts - I need to make my first gelato!! Totally. : ) This and the chestnut are grown-up flavors that I can hoard mostly for myself (and my hubby). This is Heaven in a cup! The hazelnut praline paste is a brilliant step. Bookmarking the recipe...can't wait to try! Hope you do. Can't go wrong with chocolate-hazelnut!